Allegro MicroSystems, LLC announces a revolutionary unipolar, Hall-effect switch that is unlike any other competitive device on the market today. Allegro’s A1160 solution includes an integrated coil surrounding the Hall sensing element. During normal operation, the device functions as a typical unipolar switch (output turns on in the presence of south-pole magnetic field and turns off when the field is removed), but, when the diagnostics pin is pulled high, it enters diagnostics mode. This patented feature allows current to pass through the integrated coils, generating ~20 G of magnetic field. The proximity of the coils to the Hall sensing element allows the element to sense the field generated by the coil, while ignoring external fields. In diagnostics mode the device will output a PWM signal of 50 % duty cycle when the device is properly sensing the internally generated magnetic field. The patented feature, found within the A1160 device, exercises the entire electrical signal path of the integrated circuit. It ensures proper sensing of the magnetic signal to provide accurate device functionality. 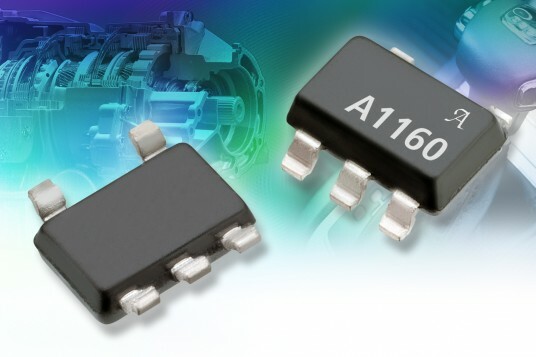 The use of the A1160 eliminates the need for redundant sensors in safety critical applications and satisfies most Automotive Safety Integrity Level (“ASIL”) requirements. Allegro’s A1160LLH-T is targeted at both the automotive and industrial markets. It has an operating temperature range of -40 °C to +150 °C and is supplied in a small, surface mount, 5-lead (SOT-23W) package.